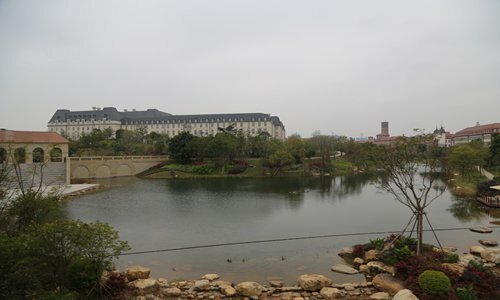 A view of Huawei's new production base in Songshanhu, Dongguan, South China's Guangdong Province. I recently visited the production base of China's Huawei Technologies in Songshanhu, Dongguan, which is also known as the world's manufacturing hub in South China's Guangdong Province. I was deeply impressed by progress that the country has made in manufacturing and I am pretty sure the factory of the future will lie in China. Huawei has been in the spotlight lately. Washington has been exerting pressure on China amid escalating trade tensions, and one of the US requests is forcing Beijing to drop its Made in China 2025 initiative, in which Huawei plays a key role. At Huawei's wireless network manufacturing department, which produces all its core products ranging from telecoms equipment to smartphones, I suddenly understood why the US is so nervous about China's rise in high-technology, especially when lights-out factories and smart production solutions are commonly seen in today's factories. These modern practices may soon reshape the global manufacturing industry. When I stepped into a production line that makes base station modules, I saw a warehouse-like room with a range of shelves where automatic vehicles were selecting and transporting hundreds of thousands of raw materials and electronic components. This process is fully automated, and it does not need any human employees or even lights. Each package of components is traced with a corresponding bar code to avoid any mistakes. As a global company, Huawei has learned a lot from foreign companies in pursuing automated production lines, improving employee management and keeping a very close eye on quality control. Apple used to be criticized by labor right groups for its contractors like Foxconn, at whose factories workers were known to commit suicide due to the heavy workload and pressure. Huawei will not follow suit, and will not make the same mistakes. At the entrance to the production line, a so-called grape board is designed for managers to learn about each employee's working status. Every morning, as each employee comes to work, he or she can pick an emoji-like facial expression and stick it to the board. If he chooses one with a sad look over one with a smiley face, his manager will have a small chat with him to try and understand any problem and try to help him out. Taking care of everyone's personal feelings in the workplace is a small thing, but it can affect output. By learning from Japanese production lines, Huawei hopes its efforts will inspire more self-motivated workers, as the world's factory is not a ruthless place where people only chase profits. From 2012 to 2017, the number of employees needed for one production line was reduced from 21 to five. Today, no worker sits at a long table, enduring long shifts and carefully assembling components. Employees have become assistants to machines, which play a major role in repetitive and exhausting production processes. Huawei's multimillion-dollar investment in research and development is paying off. Machine-learning technology developed by its labs empowers machines, and applying cutting-edge technologies to manufacturing scenarios also helps identify problems and continuously improve them. For example, with its artificial intelligence (AI) research lab, Huawei has put image recognition technology into use for tracking components in the welding process. Every step of a working robotic arm can be digitized on a computer to show how accurately it can perform. Big data is helping allocate resources in the most efficient way. A small office is located in the center of this plant, where less than 10 engineers serve as control commanders. On their computers, engineers make virtual production lines to find any possible problems that may hinder work efficiency, and find solutions before the machines begin operate. This core system is also considered as the factory's brain. It gathers and processes huge amounts of data every day to make the best decisions. Huawei's smartphone shipments reached 200 million units in 2018, and it sells countless items of telecoms equipment every day as the largest provider in terms of market share. This one smart factory, with fully connected and flexible systems, is the core of its global footprint. It also represents a vivid example of China taking a leap forward from being a traditional manufacturing hub to intelligent manufacturing. A fully integrated supply chain is one of the country's edges. Most importantly, Huawei's strong willingness to use the emerging Internet of Things, AI and big data in real-time scenarios will accelerate the country's shift to the next industrial revolution. The US government has not stopped Huawei from following its ambitions in leading the next generation of wireless technologies. It also won't stop China from achieving its targets of Made in China 2025, as the country is already on this path.